Apparently two big-shot reviewers here in New Zealand hated the recent release of Peter Rabbit (now in cinemas). I haven’t read these reviews, but I strongly suspect these reviewers are a) old men; b) white and c) are very similar to Mr McGregor, the curmudgeonly, rabbit-killing fiend of the book and movie. I loved it just as much as my children, and was snorting into my popcorn from start to finish. My 3-year old who is always on the move only got antsy with 10 minutes to go, which earned him a lifetime achievement award. My 5-year old is still going on about the movie, three weeks later. This incarnation of the much-loved tale of Peter Rabbit takes it fully into the 21st Century. If you’re a die-hard fan of Beatrix Potter, you might want to give the movie a miss; kind of like if you prefer real Winne-the-Pooh over Disney Pooh. In no way does this version of Peter – or any of the other characters – resemble the original. If you’re not a purist, then simply enjoy the ride. Peter (voiced by James Corden, who I’m ashamed to say I didn’t recognise, have turned in my movie buff card), his sisters Flopsy, Mopsy and Cottontail, along with cousin Benjamin spend their days trying to nick vegetables out of Mr McGregor’s incredible, immaculate garden. NZ’s own Sam Neil is almost unrecognisable as the grizzled, apoplectic gardener who wages war on the rabbits. 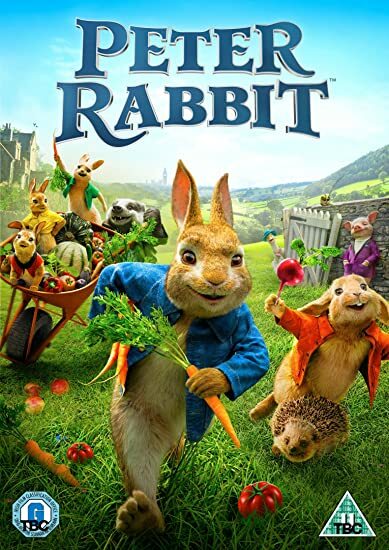 His artist neighbour, Bea (played by Aussie Rose Byrne) has looked after the rabbits since they were orphaned at the hands of McGregor, and gives them free range of her impossibly quaint cottage. Where she manages to live quite well despite creating truly terrible art and not seeming to have any other form of income…I digress. (SPOILER) Mr McGregor suffers a fatal heart-attack during a daring raid by Peter. Peter and his animal mates move into to McGregor’s house and stuff their faces with all that delicious veg. Cue party time! McGregor’s uptight nephew Thomas, played by Domhnall Gleeson (you may remember him from Harry Potter), inherits his uncle’s property. Thomas works at Harrods, making sure that everything is perfect with a capital P. Upon learning that his uncle’s house might be worth a bit of coin, he decides to go and see it, with the view of selling it. Thomas finds the house overrun with animals, and Peter finds him a challenging adversary. The two go head-to-head to get rid of each other, something made a little more complicated by Thomas falling for the lovely Bea. There’s loads of slapstick comedy – especially by Domhnall Gleeson – and the humour is pitched both at kids and adults. It’s a little bit cheeky in places (it is rated PG), but nothing outright rude. There are explosions, and yes, people trying to kill the cute bunnies, but my two highly sensitive kids, saw it for what it was – a funny plot device. They weren’t scared one jot. Peter Rabbit is a great family film, two thumbs up.